Touring colleges can be an extremely stressful process, let alone attending college for the first time as you learn to navigate class schedules, a new campus, and all new peers. Similar to your first ever day as a camper or counselor, everything is new. Your room, your friends, where you are: It’s all new. Because of this, I decided to initiate Perlman’s first ever ‘College Champs’ program, linking Perlman campers, staff and alumni to one another on college campuses across the country. Now, wherever you go (let me know if you want to get your school involved! ), you’re not alone as you’re a member of the Perlman Camp family — and it’s forever growing. 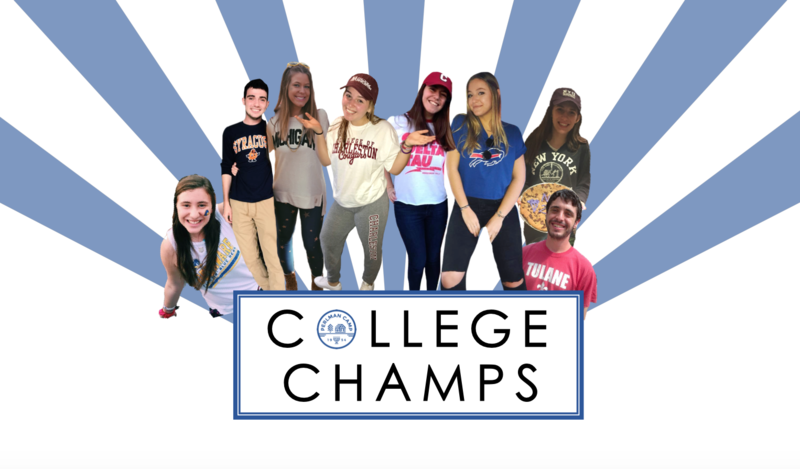 In the program’s initiation, 8 current staff and alumni on college campuses serve as representatives for the College Champs group at their schools. This program’s mission, to strengthen our alumni network, seeks to ensure that each Perlman community member is welcomed on campus and has a community from the start. These stories from across college campuses in the country, along with so many more that are to come, are what shows me how large Perlman Camp’s family truly is. The College Champs program has the ability to bring together and connect our camp community everywhere. As this program continues to grow and gain momentum, we hope to expand to any and all schools. Recognize the faces currently serving as College Champs and want to be in touch for your next college visit? Want to become a College Champ at your school? To learn more, please contact Henry at henry@perlmancamp.org.